If you think the landscape so far has been unreal, there’s still a lot you need to see. Utah is full of surprises and these two parks offer even more astounding views. You’ll also be walking in wild desert scenery, so make sure you have good maps and a compass, or a GPS. People get lost out here. Once upon a time (about 150 million years ago), there was a forest. Then there wasn’t a forest. The trees fell down or were subsumed by lakes. The earth covered them and, as the millennia passed, the wood absorbed the minerals of the surrounding geology. 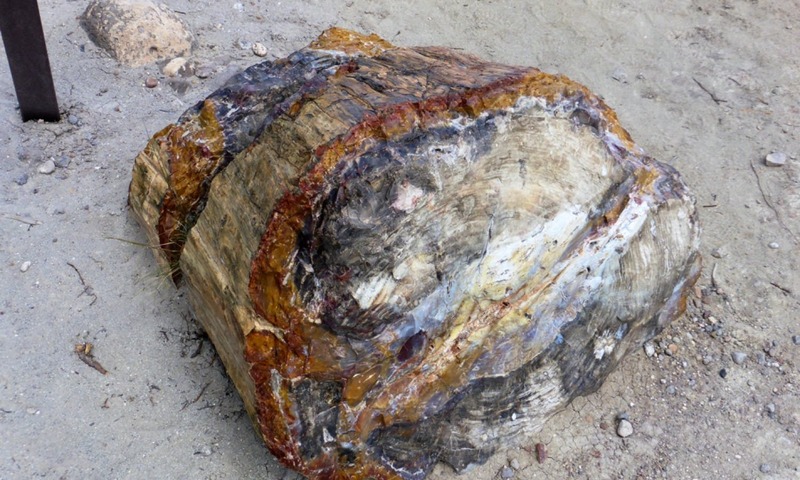 Immense pressure slowly turned the large tree trunks into massive fossils. Then the surrounding earth was eroded by water, wind and sun. The trees became visible again for the first time in millions of years and they were beautiful: pillars of multi-colored rock like marble veins or semi-precious stones. This is what you see at Petrified Forest as you walk the trails and discover the amazing trees lying around where they fell. The campsite here is also a good base to explore Escalante State Monument further down the road. 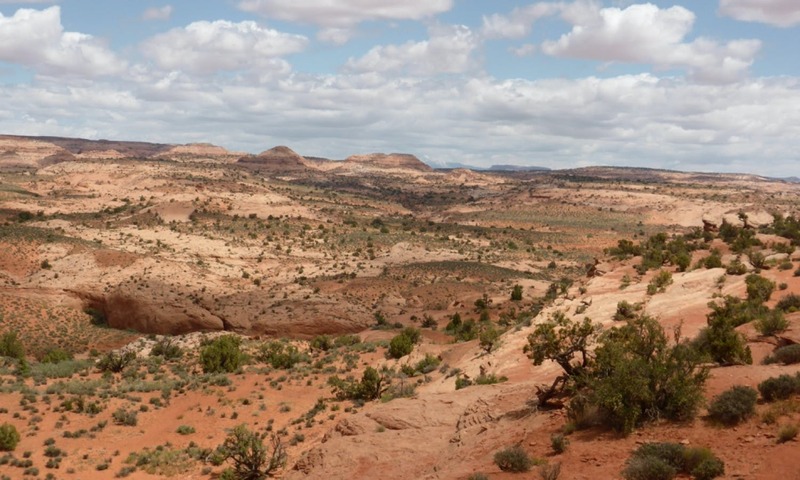 Escalante covers a huge area of arid land (1.7 million acres). From a distance, it looks like a featureless desert with a cliff and a higher plateau, but the treasures of this place require a little exploring. You need to drive out of town miles along the rough, unsurfaced Hole-in-the-Rock road that will make your teeth rattle and your car dusty until you arrive at the stunning slot canyons and geological wonders. These twisting, narrow fissures in the rock offer every visitor the change of an Indiana-Jones-style adventure . . . but also the opportunity to get lost in a brutal, waterless landscape where everything above ground looks the same. There’s a lot to see at Escalante and you might want to spend a few days exploring the area. 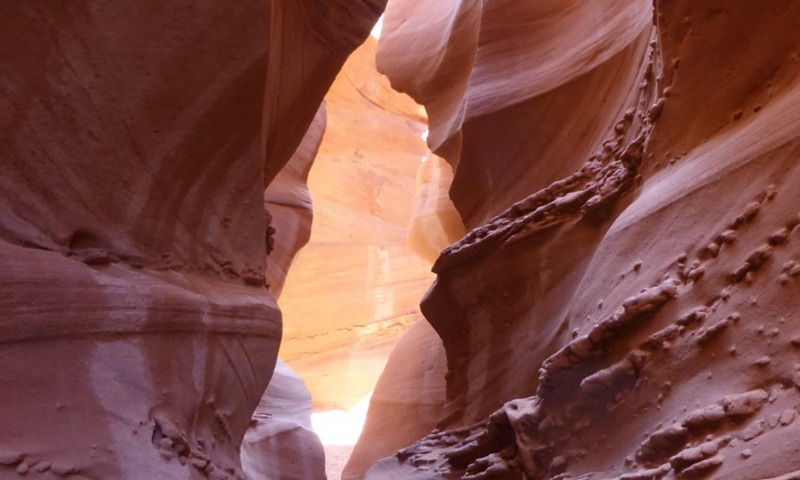 Highlights include The Devil’s Garden and Willis Creek, but the real gems are the slot canyons. These tortured, twisting corridors have been cut through the soft rock by millions of years of water, creating sinuous, flowing corridors that grow more and more narrow until the rock walls are touching your ears. You’ll have to take off your backpack and walk sideways. You’ll have to scramble up, between and through tubes of stone as the sky becomes a distant strip of light above you. Claustrophobic people should not enter. The most famous slot canyons in this area are Peekaboo, Spooky, Coyote and Zebra canyons. NOTE: Always remember to take food and water as a well as navigational equipment. Check the weather before you go – you do not want to be inside a slot canyon if it rains. Not to be confused with the place in Colorado, this tiny town (only about 150 people!) is worth visiting for a few reasons. The road to it from Escalante is one of the most dramatic – and a little frightening – in the whole of America, taking you along a knife-edge ridge and through scenic red-rock valleys where you might want to stop and have a picnic. The town itself is a center for hiking and fishing, and also makes a good base for the Escalante slot canyons. After your outdoor activities, you’ll want to eat at one of the excellent restaurants there. My recommendation: the Hell’s Backbone Grill, where the ingredients are home-grown, no-harm and organic – from the vegetables to the meat. You might even be tempted to stay there forever.